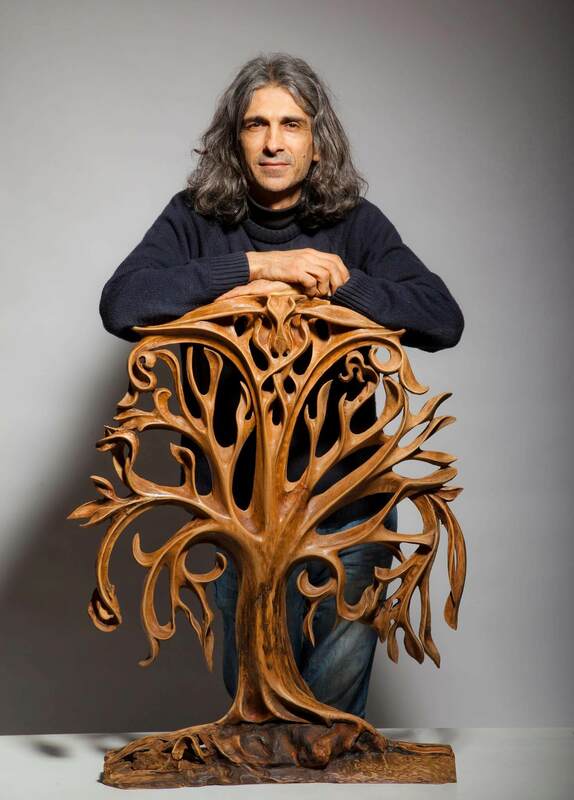 Ayhan Tomak is a Turkish painter and wood sculptor, born in Antakya-Turkey in 1970. The artist completed primary and secondary schools here and learned/ practiced wood carving first with the help of local masters at an early age. Ayhan Tomak completed his university degree at Economics in Istanbul University. He participated in the IFAR Painting Group led by Erol Deneç, and also in many group exhibitions between 1991 and 2006 nationwide, mainly in Istanbul. After 2006, he showcased his works in a number of exhibitions and workshops including Helsinki 2017 Wood Carving Workshop, Symposium International De Sculpture Sur Bois De Libreville, 2014-Gabon, Eastwood Arts Festival 2013 – Nottingham, SOFA 2011 Sculpture Objects and Functional Arts-New York, Spirits of Arts 2011, La Galleria Pall Mall – London, Art Expo 2011 İstanbul and Helsinki International Artists Association Group Exhibition, 2008 & 2009. His work includes indoor mural paintings (Wandgemälde), reliefs, and wooden sculptures. He also designed illustrations for various newspapers and magazines, book and CD covers. He created reliefs and sculptures for TV series and cinema movies. Ayhan Tomak is a member of the Helsinki International Artists Association and continues working in his own studio in Istanbul. My artistic side has developed from very early childhood. Wood, as a material from the heart of nature, has always been a source of inspiration together with its mythological importance throughout the ages and across the cultures. My designs and the type of wood used to create my art are inseparable. I never paint or add any artificial features to my wood relief sculptures and mirrors. They always preserve their natural appearance, instead I choose the type of wood, carefully selecting the grains, lines of wood, and it’s natural colour. The only treatment used on my wood carved artwork is varnish for the protection of the wood surface. I like working hard in my workshop days and nights, forming; shaping the wood, all by hand. 2013 TRT TURK, Guest artist in the morning program. 2012 TRT TURK, (National TV) Guest artist in art program. 2011 TRT TURK (National TV) Guest artist in art program. 2008-2010 Wooden Reliefs and Paint Works for the Ask-i Memnu TV series (Istanbul). 2009-2010 Wooden Sculptures and Accessories Works for the Ezel TV series (Istanbul). 2009 TRT 2 (National TV) Guest artist in the art program.